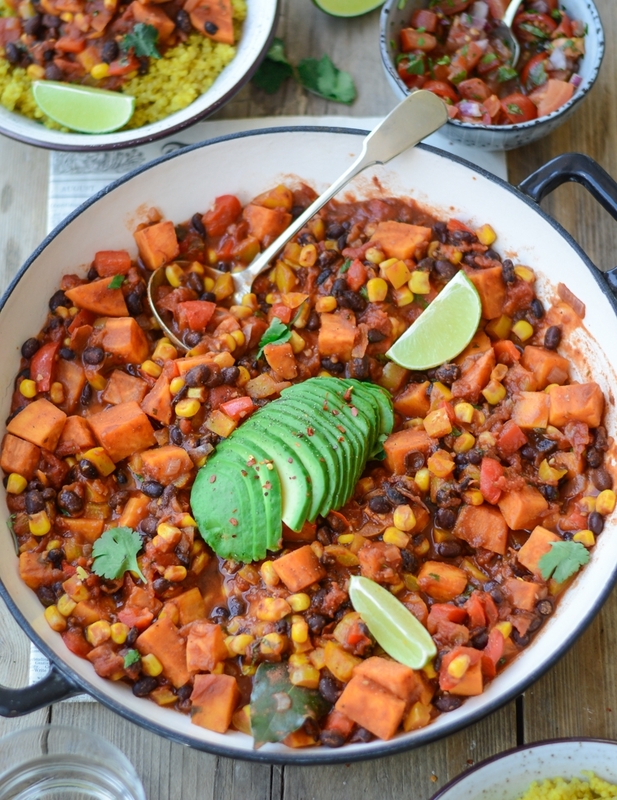 This wholesome and nutritious black bean and sweet potato vegan chilli is a big family pleaser, both for adults and children. Hearty comfort meal which takes less than 30 minutes to prepare. Vegan and gluten free. If you’ve been reading my blog for a while, you know how much I love hearty family meals, especially when they’re fuss free, take under half an hour and only require a minimum effort to come together. Are you in? I know I would be! I must be honest, cooking for (my) family isn’t always an easy task. My other half hearts a juicy piece of meat in his dinner, my daughter has a list as long as my arm of the foods she doesn’t like, so one has to be very creative to cook something everyone will enjoy (and something which will be as good as this vegan shepherd’s pie that my family still go crazy about). 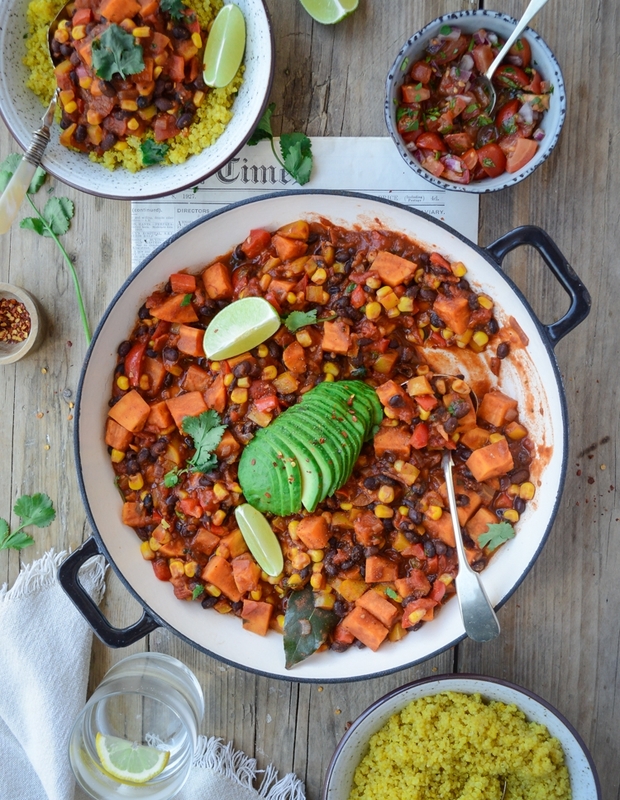 You can pair this chili with rice but I chose to serve mine with turmeric quinoa for an extra boost of protein and flavour. If you haven’t tried adding a pinch of turmeric to your quinoa before, I dare say you’ve been missing out. In my humble opinion, turmeric transforms plain quinoa into a flavoursome dish (which I can quite happily eat on its own). If you don’t like turmeric however (I know some kiddies get funny about its taste), you can leave it out all together. Feel free to adjust the amount of spices to suit your taste buds. I didn’t go too mad with spices as I was mindful of this dish to be kids friendly. As always, I’d love to hear your feedback if you re-create this recipe for your loved ones. Thank you for stopping by and see you next week. 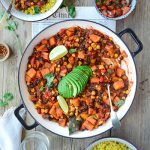 This wholesome and nutritious black bean and sweet potato vegan chilli is a big family pleaser, both for adults and children. Hearty comfort meal which takes just over 30 minutes to prepare. Vegan and gluten free. 1. In a saucepan, bring 2 cups of water to a boil. Mix in the quinoa, turmeric, salt & pepper. Cover the saucepan with a lid, turn down the heat to gentle simmer and cook for around 15 minutes until all the water is absorbed. Take off the heat and rest for 5 minutes before fluffing with a fork. 2. In a saucepan, cover the diced sweet potato with water and bring to a boil. Boil rapidly for 5 minutes until slightly tender. Drain and set aside. 3. Heat up 2 tbsp of olive oil in a big casserole dish. Add the chopped onion, garlic and tomato puree and cook for a couple of minutes until just softened. Mix in the peppers and tomatoes and stir-fry for a further 5 minutes. 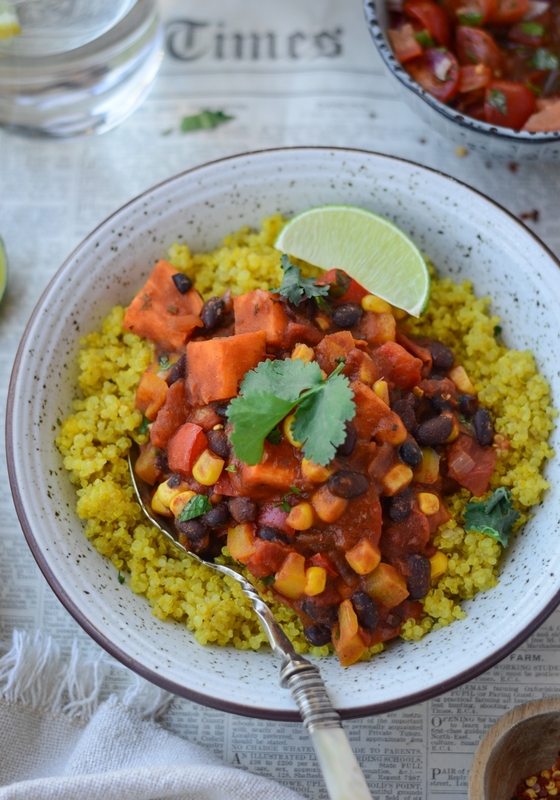 Add the cooked sweet potato, black beans, chopped tomatoes and spices (smoked paprika, cumin, ginger, coriander, bay leaves) and mix everything well. Add the vegetable stock, cover with a lid and cook on medium heat for 15-20 minutes (until the sweet potato is soft enough to eat). If the chili is too thick, add a little water to achieve the desired consistency. Stir in the sweetcorn within the last 2 minutes of cooking. Add salt & pepper if required. 4. Serve with turmeric quinoa and a generous sprinkle of coriander or parsley. what a great idea to add sweet potatoes. Have to try it. Thank you Jasmine. 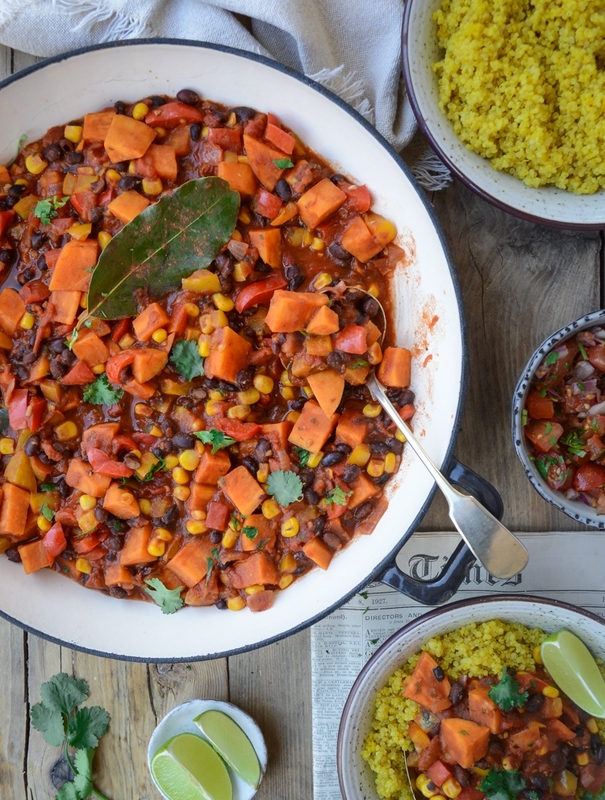 The sweet potato makes this chili so nourishing – perfect for little (and big) hungry tummies! You’re talking my language, lovely lady! It’s the simple comfort food that ticks all the boxes, doesn’t it?! My family sounds just like yours – hubby and son like meat, one daughter extremely picky (she LOVES carbs! ), and, thankfully, one daughter who is a very good well rounded eater. This chili looks fabulous! I love dinners that are easily customizable for everyone – serve it over rice, noodles, zoodles or scoop it up with crackers or chips. A family pleaser for sure. Yum! 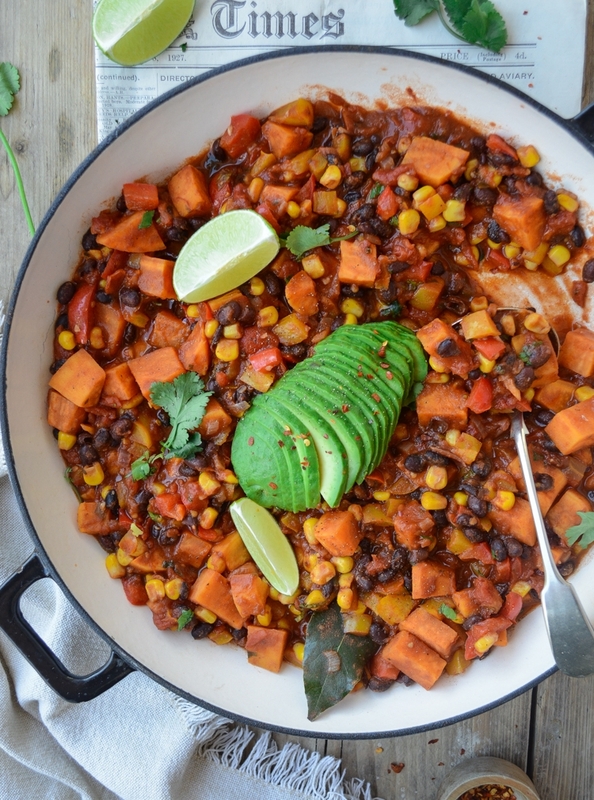 Sweet potato in chili is the best! I love that you served it with quinoa for extra protein. Looks delicious!